Be the first to share your favorite memory, photo or story of Elaine . This memorial page is dedicated for family, friends and future generations to celebrate the life of their loved one. Elaine Smith, 59, of Davenport passed away August 29, 2017 at Manor Care Health Services in Davenport. Memorial services will be held Saturday, September 2, 2017, at 11:00 a.m, at Second Baptist Church, 916-6th Avenue, Rock Island, Illinois 61201. Cremation rites will be accorded. Quad Cities Cremation Center is assisting the family. In lieu of flowers contributions may be made to the American Cancer Society in Elaine’s memory. Elaine was born March 21, 1958 in Davenport, IA, the daughter of Benjamin Daniels and Pearl Valentine Branch. Elaine worked as a waitress and enjoyed singing in the choir at Second Baptist Church in Rock Island, playing cards and dancing. 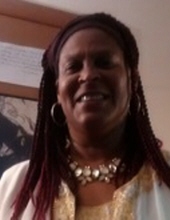 Survivors include her sons: Arpree “Rashawn” Valentine and Brice Wright; grandson: Brailin Lawrence Lindell Wright; mother: Pearl Valentine (John) Branch; sisters: Paula Valentine and Minette Barry; brothers: Mark (Christine) Valentine, Benjamin Daniels Jr. and Curtis Barnes. To plant a tree in memory of Elaine Smith, please visit our Tribute Store. "Email Address" would like to share the life celebration of Elaine Smith. Click on the "link" to go to share a favorite memory or leave a condolence message for the family.